Individual therapy is carried out by a trained therapist who meets one-on-one with a client. The goals of individual counseling can range from reducing pain, emotional, or behavioral symptoms to increasing self-awareness and greater understanding of relationships. The kind of therapist you see and your particular reason for seeking counseling will determine the goals. Most individual therapy is conducted one time per week and the sessions last about 45 minutes. Individual therapy is the most common form of therapy that is provided for anxiety, depression, eating disorders, and many other mental health and behavioral health issues. Couples therapy, family therapy, and group therapy are other ways therapy can be provided. These too can be effective for various issues including depression, anxiety disorders, and substance misuse. With that said, most studies showing that therapy effectively treats anxiety issues like Panic Disorder, Obsessive-Compulsive Disorder (OCD), Post-traumatic Stress Disorder (PTSD), depression, or eating disorders have been done using individual therapy. Some people prefer individual therapy because therapy involves discussing emotions and beliefs. Sharing that kind of information in a group format, like group therapy, can be very uncomfortable for some people. Some times that can be therapeutic, but it can also be more than someone wants to do, especially starting out. There are many scientific studies that demonstrate certain kinds of individual psychotherapy are effective in the treatment of specific mental health disorders. But, it is important to keep in mind that even the best treatments do not provide positive results for everyone. Some examples of types of Cognitive Behavior Therapy (CBT) that have been shown to be effective include Cognitive Therapy, Behavior Therapy (like prolonged exposure, exposure plus response prevention, and ABA), Acceptance and Commitment Therapy (ACT), Problem Solving Therapy, and Dialectical Behavior Therapy (DBT). Eye Movement Desensitization and Reprocessing (EMDR) and Interpersonal Therapy have also been shown to be effective for certain issues. Why CBT is the most effective individual therapy? Scientific studies have been conducted to see if psychotherapy can effectively treat different disorders. There are some disorders for which no therapy has been shown to be effective. But for many anxiety disorders, depression, and eating disorders, Cognitive Behavior Therapies (CBT) have been shown to be effective. Other therapies have been shown to effectively treat these issues as well, e.g., Interpersonal Therapy has been shown to be effective in the treatment of depression and Eye Movement Desensitization Reprogramming (EMDR) has been shown to treat Post-traumatic Stress Disorder (PTSD). But, there are far more studies that have been done on CBT. That doesn’t mean these other treatments are not effective, just that there is more scientific support for CBT than other therapies at this point. It is also important to recognize that CBT (and behavior therapy) is an umbrella term for many specific kinds of therapy that address thoughts, feelings, and behaviors. Examples include Acceptance and Commitment Therapy (ACT), Cognitive Therapy, Dialectical Behavior Therapy (DBT), and Rational Emotive Behavior Therapy (REBT). So different kinds of CBT have been shown to be effective for different kinds of mental health or behavioral disorders. So it is important to ask a potential Cognitive Behavior Therapist what kind(s) of CBT they might use in psychotherapy. If the person just says they do CBT and isn’t more specific, that could be an indication he or she has not received a lot of specialized training. Psychotherapy should certainly be provided by someone who can be understanding and empathetic. It is also important that they have been trained in effective types of therapy too. Social workers, nurse practitioners, mental health counselors, clinical psychologists, and psychiatrists can all provide psychotherapy. 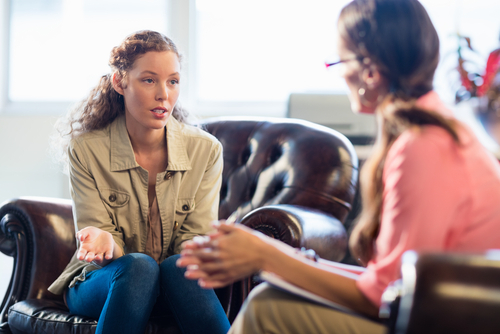 What are counseling sessions in psychotherapy like? Counseling sessions will look different depending on the type of psychotherapy being practiced. A typical CBT therapy session will frequently involve checking homework from the previous week, setting an agenda for the current session, and working through what skills were used effectively during the week, which skills need to be improved or added to the client’s toolbox, planning for the upcoming week, and collaboratively deciding what homework could be beneficial. How Are Therapy Goals, frequency, and therapy duration determined? Psychotherapy is a collaborative process. The goals for therapy are something that are determined while working together. It is important that goals are realistic. The time frames can always be adjusted as necessary, but it is better to set ones that are likely to be achieved from the start, instead of something too early that may increase the client’s anxiety or tendency to beat up on him/herself because the goal wasn’t accomplished in time. How long is one session, and how long is length of time per session? Individual therapy sessions are typically 45 minutes, but at times sessions could be 80 or 90 minutes as necessary. How is a client charged? Clients are typically responsible for payment at the time of the session. If the therapist is in-network with an insurance provider, it is possible the client may only be responsible for a co-payment and the insurance company will pay the clinician. But many therapists are not on insurance panels. In those cases, clients pay out of pocket, usually by check, although some practices accept credit cards, or even Paypal. How to find a good psychotherapist in NYC? Finding a therapist in NYC can be challenging. It isn’t because there aren’t many, rather there are so many, it is difficult to know which to choose. A personal referral from a friend or professional is a great way to find a therapist in New York. Asking a trusted internist, cardiologist, psychiatrist, nurse, or other trusted professional can be a good way to find someone who is a fit. In this day and age, you can also do your own research online. Often times therapists may be affiliated with universities or hospitals, but have private practices outside of those, or practice psychotherapy in a faculty practice at the University, or provide individual therapy in a hospital clinic. If you can’t determine that from reading about them online, calling and asking where they practice and what kind of psychotherapy is offered, as well as any financial or insurance questions, is really important prior to deciding which therapist to choose. First, you may want to jot down the kinds of issues you would like to address in therapy, e.g., panic attacks, guilt, procrastination, depression, overeating, etc. Then you can ask the professionals in your life if they recommend a good therapist who specializes in those areas. You can then read about the therapist and when ready, call to schedule an appointment. Just make sure you are clear about the kind of therapy that is going to be provided. I typically recommend that people give a therapist three or four sessions to see if it is really a fit. The initial appointments are often a little different from later sessions since they involve a lot of assessment. And it takes time to get to know each other and establish some rapport. But, if initial discomfort is high, you think the therapist isn’t going to be helpful, or there is a mismatch in personalities, there is no reason to go back even a second time. There are plenty of other therapists you can try instead of continuing with someone that makes you uncomfortable. Therapy requires you to be comfortable sharing and diligently working to change your behaviors. So you want to be confident that you are with someone that makes you comfortable and you believe can help. I want to help clients reduce their suffering and increase adaptive behaviors and decrease the problematic ones. This is all aimed to enhance life satisfaction (happiness) and help clients live more meaningful lives. I am active and directive in my work with clients, but do this in a collaborative way. I help them clarify what is most important to them in the long-term and then establish goals that are congruent with those values and principles. Then we work to provide and strengthen the skills to navigate how to accomplish those goals. The skills include how to become more aware of the thoughts, feelings, and behavioral tendencies and habits that can be barriers to achieving our goals and becoming happier and more fulfilled. Techniques include how to change feelings and also how to accept them. But in both cases, the emphasis remains on doing so in order to behave more in line with our goals. That means clients learn how to reduce a negative emotion to make behaving easier, but also learn how at times they can behave effectively even when the negative emotion isn’t going anywhere. Individual therapy can certainly address official diagnoses, e.g., panic disorder, OCD, major depressive disorder, and bulimia nervosa. But procrastination, perfectionism, tendencies to be a “workaholic” are also areas that can be addressed. Psychotherapy or counseling sessions should be customized to address problems, but can then go beyond that to enhance existing and build new strengths. In my view, all of this is done to help clients lead more fulfilling, satisfying, and meaningful lives. I typically conduct individual cognitive behavioral therapy (CBT) on a weekly basis with 45-minute sessions at my private psychotherapy practice in Manhattan. Many of my clients move to every other week, monthly, or simply finish therapy once the initial suffering has significantly decreased and they have become confident they can use their newfound coping skills. While efficiency is one of my goals, I don’t rush clients prematurely through a standard protocol. Instead I carefully assess each therapy client, so I can understand their unique aspects of personality, symptoms, relationships, values, and goals. Many clients see the elimination of symptoms as the only goal, while others decide to also emphasize improvement beyond symptom reduction, e.g., becoming more effective as a manager at work, improving a particular relationship, or starting a new business. These clients may choose to continue to work after initial symptoms of anxiety, anger, depression, or procrastination have largely been alleviated. The emphasis in my individual CBT therapy is ongoing assessment that focuses on customizing the therapy to the specific needs of the client. There is never pressure to stay beyond what is useful, but clients are also not rushed through a cookie-cutter process either. Clients develop skills and learn to use tools that enable them to function at higher levels with independence. These changes allow them to not only eliminate current suffering, but to manage new challenges. They will not only eliminate old self-defeating behavioral patterns, but to establish new patterns aimed at growth. Many clients are surprised to easily handle situations they once dreaded and to embark into areas that once scared them, and achieve their goals. Along with these successes comes a new sense of confidence and a greater satisfaction of life.